Watercolour of Gateway to Allahabad fort from 'Views by Seeta Ram from Benares to Nazibghur Vol. III' produced for Lord Moira, afterwards the Marquess of Hastings, by Sita Ram between 1814-15. Marquess of Hastings, the Governor-General of Bengal and the Commander-in-Chief (r. 1813-23), was accompanied by artist Sita Ram (flourished c.1810-22) to illustrate his journey from Calcutta to Delhi between 1814-15. The Allahabad fort and palace was built by Mughal Emperor Akbar (r.1556-1605) between 1583-84, at the junction of the Ganges and Jumna rivers. Though most of the Allahabad fort has been demolished, the zenana pavilion for women still remains. In 1798, Nawab Saadat Ali Khan of Awadh (r.1798-1814) ceded the fort "to the East India Company to their exclusive possession with all its buildings and ghat, immediately dependent on the fort as necessary for the purpose of an esplanade." 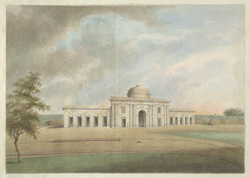 According to Lord Moira who visited the fort in September 1814, the exterior of the fort including the wall and gateways had been rebuilt in an European manner, explaining the change in architectural style. This view shows the west gateway to the fort at Allahabad, in English classical style with a dome, with the beginnings of the parapets and glacis on either side.